The only redeeming quality of a Little Debbie snack, is the fact that every "treat" in the box comes in its own little wrapper...like a little present. Then you get to open them, and taste mediocrity at its best. It's like a disappointing Christmas morning every time you open the box. These brownies hold true to Little Debbie form. Wax-like, fake chocolate, and a enough sugar to keep the cane fields in Louisiana employed for years to come. 1 Star. Yeah buddy. Any way you can pack more choco into a brownie is fine by me. 4 stars. I don’t eat chocolate but I can’t be mean to a cute redhead, even if she’s animated. 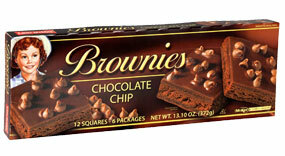 Little Debbie and her chocolate chip brownies get 4 stars. These brownies get a Quick Hits average rating of 3 Stars! !